These succulent, ganache delicacies are Dorothy’s signature piece. Each truffle is made by hand in our own kitchen blending the very best of ingredients such as fresh creamery butter and essences of liqueur. We even use American grown rose oil -- so luscious and so good for you! 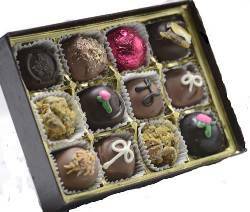 Our Ganache Truffle Fancies contain each of our truffle flavors: Cheesecake, Grand Marnier, Pistachio Kirsh, Caramel Latte, Almond, Caribbean, Dark and Dark, Raspberry Rose and Vanilla Bean. Truly incomparable. From Clay Bossart of Monroeville, Pennsylvania on 2/20/2016 . From Dave of BLAIRSVILLE, Pennsylvania on 4/11/2015 .